Inspiring Healthy Families Since 2009! RFM is produced by a team of parents to inspire, enlighten, inform, and entertain. We make it our mission to include articles in each issue that appeal to readers with children of all ages – and lots of readers who don’t even have kids. We’re Richmond’s trusted family-lifestyle magazine! 100,000+ RVA Families Spend Time with RFM Every Month! 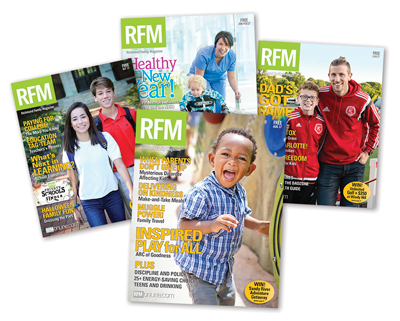 RFM is free on the racks each month at any area Kroger, Food Lion, WaWa, Wegmans, and Publix – and many other locations across Greater Richmond – from Ashland to Petersburg. You’ll find RFM at more than 850 locations all over the region, in libraries, museums, fitness facilities, doctors’ offices, waiting rooms, ice cream and coffee shops, restaurants, hair salons, family activity centers, and just about anywhere you shop, work, and play. Would you like to have RFM available at your business? Every month, RFM readers reach for RVA’s favorite free lifestyle magazine. If your place of business is interested in distributing RFM, please click here to request information on becoming a distribution partner. RFM is free all over Richmond, but if you’d rather have it mailed to you, we can do that too! Subscribe to Richmond Family Magazine for just $15 a year. Click here to email the publisher for additional information.